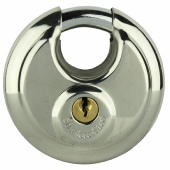 Bulldog MC10 Padlock. 70mm diameter stainless steel body. Supplied with 2 keys. 70mm diameter stainless steel body.